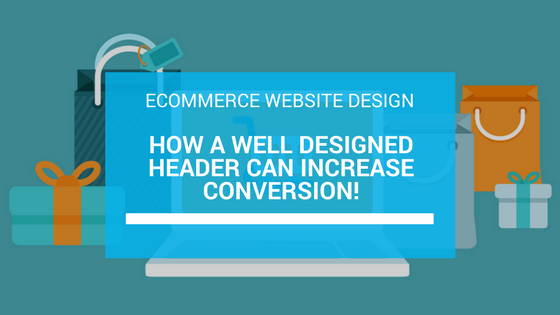 If you’re an eCommerce website owner, have you ever thought of strategies to boost sales with a well designed website header? In this article, I’ll show you how. Often times, eCommerce website headers are neglected. 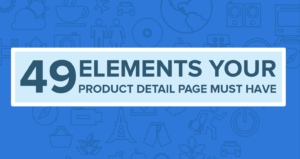 Most eCommerce website owners and marketers spend more time on product pages and checkout pages. But you should also look into global elements like headers, the first thing potential customers see when they land on to your website. This is even more important because according to Statista, eCommerce sales is projected to exceed $2.3 billion US dollars by 2018. You can tweak your website header, and use it to persuade your customers. With your eCommerce website header, you can stand out from the competition and build a thriving eCommerce business. Why not get an edge over your competitors by creating an outstanding header that will attract your customer’s attention — and watch your conversion rate and traffic soar? However, the purpose of having a well-designed website header is to engage your customers and give them a reason to buy from you. Whether you’re going to use paid advertising, mobile marketing, or blogging, your website MUST be ready for customers. A unique header can improve your website responsiveness, and aid consumers in navigating your eCommerce web pages easily. If consumers are unable to navigate your website, it can cause them to switch brands. This data found that 90% of website users leave due to poor navigation. Website navigation is like a road sign. If it’s not clear, you might miss your route and waste both time and money. This is exactly what happens when your customer visits your eCommerce website and finds it daunting to get the information or product they want to buy. According to the Aberdeen Group Analysis report, it’s been revealed that responsive designs, that are easier to navigate will improve the annual performance of an eCommerce site. However, poor navigation automatically kills customer’s interest. And this would definitely have a negative effect on your business outcome. But with a well-designed header, it becomes easier and clearer for consumers to get to where they wish to be since your header conveyed its purpose perfectly well. Now that more customers are on smartphones its important that your header is well designed across all the devices (phones, tablets and laptops/desktops). For platforms like Shopify, this is easy to implement as they have themes that are already responsive. And as Shopify experts, we have customized many of their themes to match to our client’s requirements. Converting new visitors to potential leads can be tedious work. However, having your site’s key benefits well stated out on the header will encourage your site visitors to take action. It’s not just about having a good header, but one that has something tangible to offer. Work on your customer’s emotions with words and phrases that are compelling, like free shipping, discounts, and open return and refund policies. One report proves that customers are more likely to buy products they previously abandoned in the cart if offered a discount. Don’t forget, emotion drives decision. Customer satisfaction is the major key to customer retention and conversion. More importantly, working on your existing customers’ emotions will also be a big boost to your business. Since one happy customer is likely to direct nine new customers to you, this is not just true for eCommerce websites but also for small business website designs. It’s important to perform A/B testing of two or even three variations of your website header, to determine the one that works for your business. A value proposition is an assurance of value and other key differentiators that separate you from the competition. Once someone is on your company homepage, a customer will be more eager to know what your eCommerce website is offering. So, if your header can clearly state your business’ value proposition, your visitors are likely to convert because they can make informed decisions quickly. The image below explains the features of a great value proposition, which you as an eCommerce marketer can leverage on to increase your sales. The eCommerce space is complex and competitive. If you want to cut through the noise, you need to build your brand. That should be your #1 focus. Have you ever wondered why most new businesses rise to become a popular brand? Could it be that they have lots of money or a brain box behind them? I don’t think so. The truth is, they know how to connect with customers. This is true even for small business website designs. Do you know that 78% of consumers agreed that they encountered a new brand while searching online. And no doubt, that could be your opportunity to gain more attention — if you header depicts a captivating brand identity. 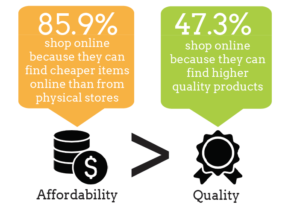 Make sure you clearly state the benefits of your eCommerce website. Yes, it should be on your website header. For instance, Coca-Cola being one of the biggest successful company in the world, popularly known as coke used the tagline – “Have a coke and smile” in 1979 to propagate their product which has always been a boom. Remember that your eCommerce website header is an important aspect of your business. Use your website header to enhance your brand image when your customers — and help them understand the benefits they stand to gain from your brand. No matter your level of expertise in eCommerce, you have to understand that your target audience wants to connect with you personally, and can relate to every element on your website – especially those above the fold.